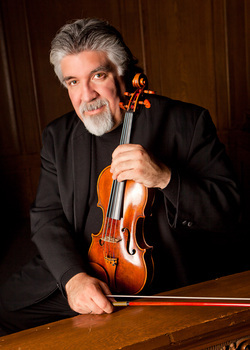 Since capturing Second Prize in the 1982 Tchaikovsky International Violin Competition in Moscow, Mr. Cárdenes has appeared as a soloist on four continents with over 100 orchestras including The Philadelphia Orchestra, Pittsburgh Symphony, Los Angeles Philharmonic, St. Louis Symphony, Moscow Philharmonic, Dallas Symphony, Helsinki Philharmonic, Shanghai Symphony, Sinfonica Nacional de Caracas, Sinfonica de Barcelona, and the Bavarian Radio Orchestra. He has collaborated with many of today’s greatest conductors, including Lorin Maazel, Rafael Frühbeck de Burgos, Mariss Jansons, Charles Dutoit, Christoph Eschenbach, Sir André Previn, Leonard Slatkin, Jaap van Zweden, David Zinman and Manfred Honeck. This year and next Mr. Cárdenes continues his project to record many standard and contemporary concerti. Released in 2009 are recordings of concerti by Brahms, Mendelssohn, Beethoven, Barber and David Stock on the Artek and Albany labels. Plans to record Bartok’s Second Violin Concerto and the new version of the Viola Concerto are slated for 2012, along with other sonata recordings with pianist Ian Hobson. A recording of the complete works for violin by Leonardo Balada was released on Naxos in January 2011, with the complete Sonatas by Hindemith and the Beethoven Violin Concerto on Artek, to be released in the fall of 2011. Cárdenes’s discography includes over two dozen recordings of concerti, sonatas, short works, orchestral and chamber music on the Ocean, Naxos, Sony, Arabesque, RCA, ProArte, Telarc, Artek, Melodya and Enharmonic labels. As an ambassador for music of our time, Mr. Cárdenes has commissioned and premiered over 65 works by American and Latin American composers such as David Stock, Leonardo Balada, Ricardo Lorenz, Eduardo Alonso-Crespo, Roberto Sierra, and Marilyn Taft Thomas. His concerto repertoire includes over 100 works, ranging from the Baroque era to the present. Mr. Cárdenes has twice served as President of the Jury of the Stradivarius International Violin Competition and in 2011 will join the jury of the Tchaikovsky International Violin Competition in St. Petersburg, Russia. A Cultural Ambassador for UNICEF from 1980-1991 and an indefatigable spokesperson for the arts, Mr. Cárdenes has received numerous awards for his teaching, performances, recordings and humanitarian efforts, most notably from the cities of Los Angeles and Shanghai and the Mexican Red Cross. He was named Pittsburgh Magazine’s 1997 Classical Artist of the Year and received the 2001 “Shalom” Award from Kollell’s International Jewish Center for promoting world harmony and peace through music.